On 22 May ‘Team AvMA’ took part in the London Legal Walk 2017. Our fundraising manager, Phil Walker, reported back from the event. It was a very warm and muggy Monday evening outside the Law Society when AvMA staff, trustees and supporters gathered for the London Legal Walk 2017. Altogether there were 18 of us and once changed into our AvMA running vests, we began our trek through the busy streets of London. Our plan was to walk the traditional Hyde Park route and, armed with our maps, we set off. However the crowd of walkers was massive and we found ourselves in a large group walking toward Blackfriars. “This is the alternate route” I commented, but we were swept along by the sheer weight of numbers and could not change direction. We went with the flow and marched across Blackfriars Bridge, following the route along the South Bank. We passed bemused crowds of overseas tourists queuing for the big wheel wondering what 10,000 people in t-shirts and running vest were doing marching past. We made it halfway to Vauxhall Bridge and then headed back on the north side. By now the crowds had thinned as people not used to powerwalking slowed. We passed the Houses of Parliament and made it back to Temple and the finish line. 10k in under two hours – surely Team AvMA was among the fittest! We all shared a well-earned drink to celebrate our success. Most importantly, our efforts had raised over £1,600 so far to help fund our vital patient safety work. And it’s not too late to add your support. 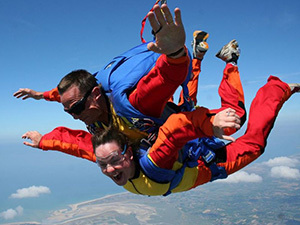 Would you like to complete a parachute jump in support of AvMA in our 35th anniversary year? Our finance manager Nicky Rushden is looking for people to join her on Sunday 17 September for a tandem parachute jump to raise money for our patient safety work. If you are interested, please contact Nicky here.